Do you get a vision in your head when someone mentions a certain food? I do. I am not a sweet and savory kind of person. (Unless we are talking peanut butter and pretzels) So, I don't really care for mixing my sweet squashes with savory foods. Anyway, this is not the point. The point is, when I mention certain foods to the illustrator, he gets a thought in his head about the food. So, this morning, when he asked what was in his oatmeal...I said sweet potato. Well, it wasn't. It was butternut squash. I have been searching everywhere for pumpkin and have not found it anywhere. So, I grabbed a butternut squash from the store the other day to have with my oats. 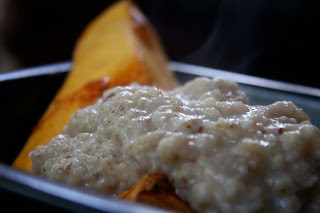 I usual mix unsweetened applesauce into my oats because I love the consistency it adds to them. The illustrator loves sweet potato oats (more than pumpkin) so I figured this was a little white lie. I discovered a while back that oven roasted butternut squash with oats...is a perfect combination! The caramelized edges of the squash are so sweet and tasty! I normally mash them up and stir them in, but this morning I went a different route. This was so good! Not to mention good for you! Hello vitamin A, vitamin C, potassium, fiber, a little calcium and protein too...do I need to go on? You really can't beat a food like this that is so low in calories/fat and so good for you. The only thing it was missing...a scoop of vanilla ice cream I made the other day. I blame HEAB for making me want my breakfast A la Mode! Almond butter would have been amazing too, but sadly...I am out! Preheat your oven to 400 degrees. Coat the pan with cooking spray. Peel and cut your butternut squash (This one was small, so I quartered it). Spray the squash with a little cooking spray and roast for about an hour. *I also like to use a little coconut oil when I roast mine, but I was trying to get the kids to school on time and I had to put gas in the car...so I went for quick this morning. By the way, I did fess up to the illustrator. He is really good about trying new things, but I wanted to see his reaction. He loved it! LOL, little white lies with vitamins. 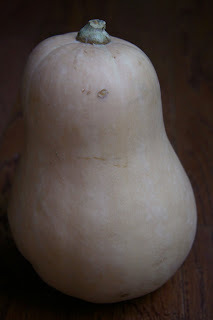 I think butternut squash is just as sweet as a sweet potato, but more watery. I'm a total sweet + savory person, but Dustin's not. He likes his savory straight up and his sweets 100% sugar, lol. 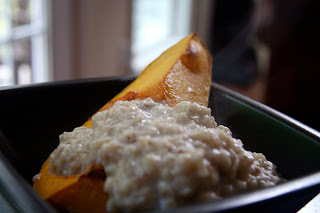 Squash + oatmeal sounds fantastic! Must try asap. I like sunflower seed butter as a savory add to my oatmeal, but I'm yet to jump on the bandwagon of adding other things such as squash or pumpkin... not sure why... just makes me nervous! Oh sounds good to me. LOVE butternut squash. I was unable to find canned pumpkin for a long time too. Finally found it at Whole Foods and snagged it up, but have been saving it, hording it really. Really, though - before my mom was as open to trying "my" food, I'd give the "short answers". I'd say I'd make rice when I was really planning on bulghur or quinoa. She'd never know what to expect when I'd say I was making burgers, either! And I am a total sweet + savory kinda girl, as I'm sure you know ;) I've only ever had frozen butternut squash. I should probably change that, hm? I'm a little afraid - I'm just not much of a squash person! i've cooked sweet potatoes with coconut oil before and loved it! your breakfast version looks great! love b'nut squash! I cut it up and make a "puddle" in the hole with brown sugar, maple, cinny, ginger, mustardd..so good! I like butternut squash more than pumpkin for sure. I find a lot it sweeter and more caramel-y tasting.